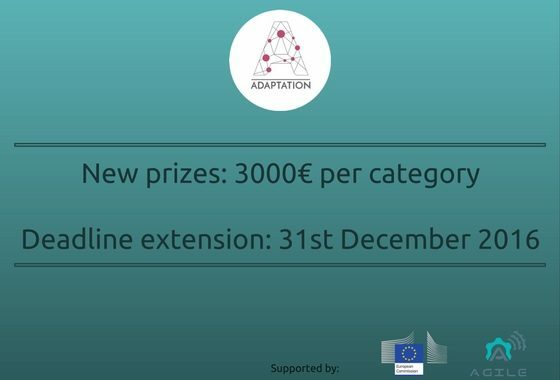 Adaptation: Deadline extension & New prizes! 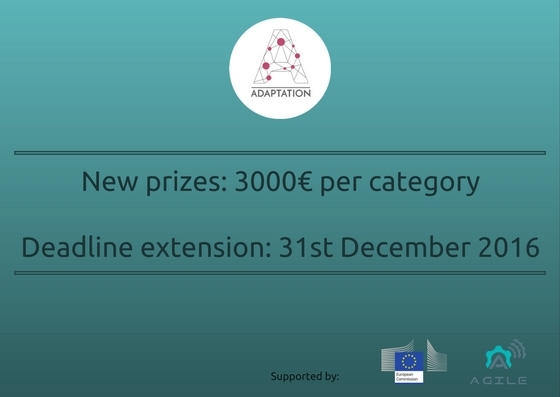 Deadline extension: Due to the improved conditions of the rewards, we have decided to extend the deadline to the 31st of December so new artists can send their proposals and so those who already sent theirs can update them given the new conditions. Are you still wondering what Adaptation is? Check it out in our introductory blog post. Remember that in order to send your proposal you will need to send it to iot.is.art@agile-iot.eu before the 31st of December, and it should include how you will be making use of the AGILE gateway as an intermediary point between the sensors and the audiovisual representation of the data. More information about the guidelines here: http://agile-iot.eu/adaptation/guidelines.html. Posted in Events and tagged Adaptation.